What a sad great loss for all of us who enjoyed simple Italian food. 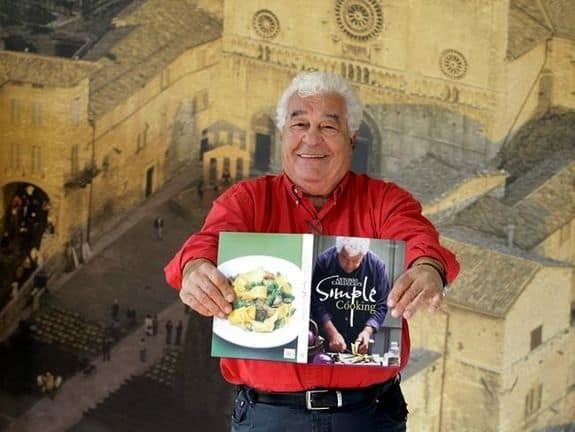 A great likeable man with a simple passion for food LONDON – Celebrity chef Antonio Carluccio, who helped popularize inexpensive Italian fare as the founder of an eponymous restaurant chain and a prolific cookbook writer, has died. He was 80. His death was announced on Carluccio’s website, by the restaurant business on Twitter and by his agent on Wednesday. The cause was not immediately revealed. Carluccio first came to prominence in Britain while running the Neal Street Restaurant in Covent Garden in 1981, earning a number of accolades and hosting famous patrons who included Prince Charles and Elton John. Antonio bought Neal Street Restaurant in 1989, and the Naked Chef himself, Jamie Oliver trained under Antonio in the kitchen. Later in 1991 Antonio and his then wife set up an Italian deli called Carluccio’s. In 1994 the company branched out into wholesale and in 1999 the first Carluccio’s cafe was opened. The business incorporated both a food shop and a restaurant and it expanded into a chain across the southeast of England. He also helped launch the career of chef Jamie Oliver by hiring him to work there. He co-founded what became the Carluccio’s chain in 1999 and remained involved after selling his interest in the business.